Bright streaks of light pierced the El Centro, California skyline on September 23, 1929 with the arrival of a baby girl named Danny Irene Quinn. She was the fifth child born to the late Reverend Alfred and Essie Quinn and excitedly welcomed by her three sisters and one brother. She was preceded in death by her parents all of her siblings. Danny enjoyed her childhood as a minister’s daughter being taught caring, sharing and training which was to serve as a precursor to all her later years. Those qualities instilled to her forever a fond and lasting love for family and friends. She attended public schools in Santa Monica, California. In 1943, the family moved to San Diego, California when her father was sent to Bethel A.M.E. Church as pastor. After graduating from San Diego High School, she continued her education at San Diego City College and San Diego State University. Shortly after the completion of her education, she married Marvin C. Brown of the United States Army. A son and daughter were born to this union. Not one to sit still, Danny participated in many church and community activities. 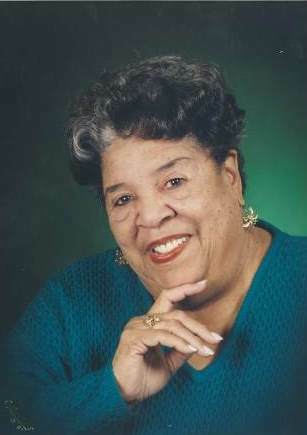 She was a charter member of the Ada B. Cleveland Chapter 71, OES, the Women of Wonder Red Hat Society; Membership Coordinator of several local social clubs, member of the Democratic and League of Women Organization, including several other civic groups. With all of her activities, she was very active in her church throughout the years of serving as choir director, secretary, pianist, class leader, bible study and assisted other church functions for music. Danny was employed at the Naval Aviation Depot for thirty years. She received many awards, was editor of the Command Newspaper, served as Public Affairs Specialist and named Federal Employee of the year for exemplary service. Her participation in so many phases of fun-travels, especially cruises to various places will be remembered by the many friends and relatives. Very early in Danny’s life, her Christian parents lit a spiritual flame which never diminished. She remained faithful until our Heavenly Father set her undaunted spirit free. She went forward to meet her maker unafraid. Danny’s spiritual legacy of love, strength and courage is hereby bequeathed to her son, Marvin Brown (Doris) of Santa, Monica, CA; her daughter, Marla Howard of San Diego, CA; one sister, Sheila Thornton of Sacramento, CA; granddaughters, Charvette Brown, DaRaya Howard, Danny Howard and Kara Howard all of San Diego; grandsons, Marcus Brown, of Santa Monica, CA; Christopher Colbert of Oceanside, CA; nine great grandchildren; three great-great grandchildren, a host of nieces, nephews, cousins, other relatives, her church family and many friends.